I’m so excited because it looks like Olivia’s Choice will finally see the light of day! I have the cover ready and I’m just waiting to see it published in Amazon. Once it’s ready, I’ll put up a link! Since I didn’t get published when I had announced, I thought I should do something for the blog readers. I can’t publish an excerpt from one of the books, but I thought I could do a little something else. In the extras tab, I’ve grouped a few quotes, sayings and funny bits from the books. Hope you enjoy them! Hi everyone! Just started the blog and I’m thrilled. It’s in pretty rough shape but I can start adding information about my upcoming books and that thrills me to bits. 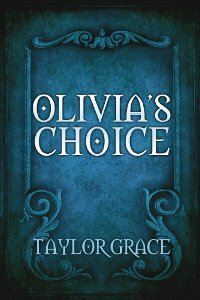 I finished Olivia’s Choice early May. I’m trying to get it to see the light of day. I thought I’d get it out there in September or October…but life happens. I’m still trying but I need to be patient. As soon as I know, I’ll post it. Currently, I’m working on Klias’ story, the second book in the series called Amy’s Courage. I’m about a third of the way in. I also have a pretty good idea of where the series will go after this. I think the third book will be about Prince Haar of the norns. After that, we’ll see where we are. One last bit. Please be patient with this very, very rough blog. I’m learning as I go. If you have any tips or words of encouragement, please send them my way!